You should continue to mow and water your lawn as you have all summer. As it gets closer to winter and you can project stop cutting the grass, then drop your blade to its lowest setting for the last two cuttings. That will allow more sunlight to reach the grass and there will be less of it turning brown during the winter. The fall is a great time to area to your lawn so that oxygen, water and fertilizer can seep into your grass roots. 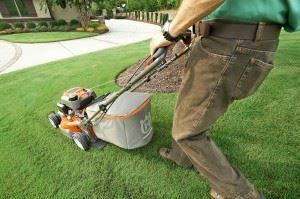 You can rent a gas powered walk behind lawn aerator or get a manual push version. What you’ll be doing is punching holes in your soil for fertilizer to go into. Raking leaves in the fall is part of being a homeowner. Unfortunately, much like shoveling snow, this is a task that needs to be done as soon as possible. In other words, don’t wait until the last leaves have fallen before you start raking. It’s not inconceivable to think that you’ll be raking leaves for a few weekends in a row. The more you can keep ahead of the better off you’ll be in terms of those leaves getting wet and stuck together. There are some lawnmowers that have a vacuum bag collection system that you might want to try if you’re tired of the raking. Just be sure to clean out those bags at the end of every use. Speaking of lawnmowers, if you’re old lawnmower has finally broken down, then you would be well advised to get rid of it and buy a new one now. In the spring, prices for lawnmowers will probably be a lot higher. To make room in your garage you can always count on Junk King Chico to pick up your old lawnmower and the rest of the yard waste you’ve created during your cleanup. The crew from Junk King Chico is not afraid to get their hands dirty and that means giving you a clean yard in return. Put them to work today. This entry was posted in Chico Junk Removal and tagged Junk King, junk removal, lawn, lawnmower on September 25, 2017 by Junk King. Last updated September 25, 2017 .